Firearms officers might have to "walk over casualties" in the event of a Paris-style UK attack to deal with the threat, a senior officer has said. Metropolitan Police Assistant Commissioner Patricia Gallan said officers would "go forward" to confront gunmen in a marauding attack. She was speaking after an exercise to test the way armed officers would deal with an incident in a shopping centre. This routine training was arranged before the Paris attacks. The firearms tactics were made public for the first time after the training exercise, although the approach has been used since the attacks in Mumbai, India in 2008. BBC home affairs correspondent Danny Shaw says although negotiation is still an option, armed officers are now trained to meet the threat head on, rather than stand back. The Paris attacks appear to have reinforced the view within policing that officers need to go forward, he added. Media captionMet Police: "Tactics have changed ... we now go forward to meet the threat"
Ms Gallan, Scotland Yard's head of specialist crime and operations, said the policy "would potentially save the most lives". "We appreciate within that there could be casualties and when meeting that threat they will have to walk over casualties that might have been injured and wait for somebody else to treat them as they go forward," she said. She added that the casualties might also include officers' colleagues. "The most important thing is to actually get to the threat and stop them killing additional people, and that is why we've got to keep going forward and not tend to those that are injured at the time," she said. 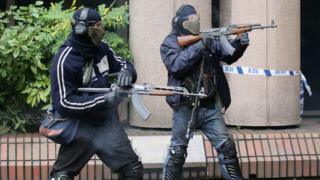 At 11:00 GMT on Tuesday, a group of men with guns stormed an empty office complex in central London. It was the latest in a series of terrorism training exercises for police firearms officers, which have an extra sense of urgency about them since the Paris attacks. The air inside the building soon filled with grenade smoke and the sound of gunshots, though the weapons fired paintball pellets rather than live rounds, one of few concessions to health and safety. This is about as realistic as a training session can be. There remains a place for patient negotiations; incidents will still be assessed case by case. But police know they have to be able to confront attackers head on, at speed, without looking back - and training is the best way to prepare. There are more than 2,000 firearms officers in the Met and Ms Gallan said there was a "very good possibility" there would be an increase in the number of officers trained and authorised to carry guns. The training exercise simulated a group of terrorists armed with guns and bombs storming a shopping centre. It took place in the City of London and was part of annual training for the Met's authorised firearms officers. Armed response patrols in London have been stepped up since the attacks in Paris last month, which left 130 people dead and hundreds more injured. The group calling itself Islamic State has said it carried out the wave of shootings and suicide bombings, which targeted a concert hall, bars and restaurants. Paris attacks: Could they happen in the UK?